Avery Products launches collection, featuring designs inspired by Illumination and Universal’s Despicable Me franchise. 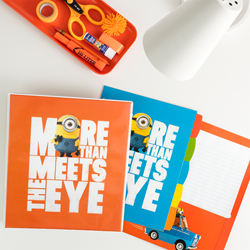 Avery Products Corporation, a leading manufacturer of school and office supplies including binders, dividers, highlighters, labels and more, introduced their newest collection of organization products featuring officially licensed designs inspired by Illumination and Universal’s Despicable Me record-setting franchise. The products are available on avery.com and amazon.com, and for a limited time, consumers can take advantage of Amazon Prime Day deals and get 30% off these Durable View Fashion Binders from July 16th-17th on Amazon. To learn more about these products and to purchase items, visit the Despicable Me page on avery.com and amazon.com.